My wife gasped on the phone. She saw a hawk with a fish clutched in its talons. “I’m not used to seeing nature like that in the city,” she explained. She grew up in rural Colorado, the Rockies, so I understood what she meant. A common sentiment: nature is out there, the city is here. A belief I’ve only just abandon as of late. I had never thought about nature in the city before. I separated them in my mind. The Appalachian Trail and Florida reefs are considered nature; the roads to my school, my house, and the restaurant I frequent, city. I admit. I would look at grey and brown striped lizards scuttle across concrete paths and climb up palm branches in my front yard. I’d see Tropical Orb Weavers weave webs between my live oaks and Jeep Wrangler. I’d see nature, but it wasn’t really nature … at least that is what I thought. Yet it was. City and nature aren’t separate at all. They are one. There is nature in the city. We have moved in on nature’s turf and built our city here. I cast aside my separateness lately. I encountered nature retaking city on a large scale at Fort Dale on Egmont Key, and the city splintering into nature through my exploration of Salt Creek. If you look at the creek on the surface, you will see pollution, trash and not much more. But if you look deeper, if you look at the heart of Salt Creek, you will see multiple natures. My first time on Salt Creek, I noticed beer cans reflected the sun through the murky water. Metallic buoys, bouncing up and down in the waves. Faded and crushed aluminum, submerged like a watery tombstone memorializing what was God’s beautiful workmanship. The first can I see in Salt Creek is a Coors Light. 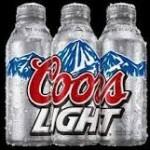 Cold as the Rockies, I hear the commercial in my head. The company uses nature to advertise beer; it is the backbone of their marketing. It is refreshing, sweeping shots of the ice and snow covered caps of the mountains; climbers breaking away a six-pack. But they do not have to worry about beer cans scattered across their peaks and cliff sides. Instead their cans end up in rivers, oceans, and creeks. The can travels nearly the length of the country to end up in Salt Creek. Then again, when did an aluminum can stop being nature? Was it when we pulled the ore out of the ground? When we shaped it, molded it, filled it with a concoction of natural ingredients? That can is still nature, even though we shaped it. That sun-bleached faded can bobbing in the creek tells a story about city and nature. The beer can tells the story of how we encroached on nature and over time, forgot about it. We fragmented a creek, built around it, and walled up parts of it. Salt Creek had been invaded. Forgotten and neglected over the decades, Salt Creek is overgrown with mangroves, Brazilian pepper and trash. Even though the creek is broken, however, it is no less nature. Nor is it even ugly. The beauty is in its wildness and juxtapositions, its blending of nature and city. It is interesting to me how we “make” nature sometimes. Take barge reefs, the ultimate blend of city and nature and a place of wildness. I’ve gone diving many times in the gulf and down in the Keys. And many of those dives revolved around a man made object — a retired with no use, except to become nature again. It is no different in Salt Creek. What we view as trash, nature can reclaim. Salt Creek represents nature fighting back and reclaiming the city. My last trip to Salt Creek required some clearing to get through the overgrowth; it was like an exploration into wild lands. Yet I was smack-dab in the middle of the city. No more than a hundred feet to either side of me cars zoomed by. We reached Bartlett Pond and as I looked into the water, just from looking at it I felt I needed a Hepatitis Shot. I was in nature even though it became murky and foul. And as I start my journey back I pass a group of traveling snails, perched on the back of a floating styrofoam cup.